with Lefevre Gallery, London, October 1950, where purchased by Lady Vansittart, and by descent to the previous owner. Anonymous sale; Christie's, London, 8 June 2001, lot 63, where purchased by the present owner. 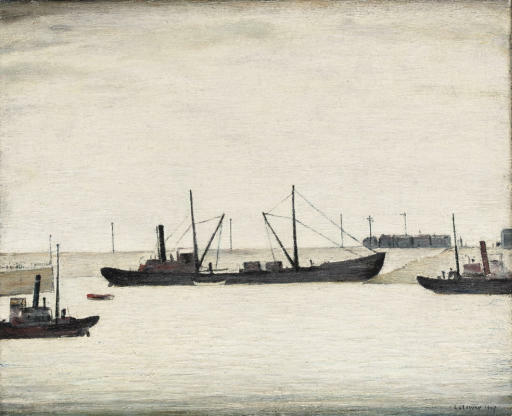 Lowry painted the sea throughout his career, recording that he had first drawn ships at the age of 8 years old on family holidays at Rhyl or on the Fylde coast. In old age he was particularly drawn to the North-East coast and travelled there for prolonged stays at the Seaburn Hotel in Sunderland, commenting, 'Some people like to go to the theatre, some like to watch television, I just like watching ships' (Daily Telegraph, 1 November 1963). Michael Howard (Lowry: A Visionary Artist, Salford, 2000, pp. 234-35) links the artist's love of the sea with his sense of man's spiritual journey, 'the sky gives way in these works to an illuminating opalescent light in which land, sea and sky merge into one luminous or mist-shrouded unity. The heavy ships that populate Lowry's later paintings and drawings move through the implacable waters with no apparent sign of human involvement; there is never a glimpse of figures working the vessels, which seem to move of their own mysterious accord. In Tanker off Dunnet Head (1970), for example, Lowry perfectly captures the dense black silhouette of the merchant vessel etched against the brilliant crystalline light ... It is an image at once delightful and accessible, a metaphor of each individual's journey through the vicissitudes of life. Ships and Boats are more than mere carriers of cargo, they are loaded with a host of romantic associations encapsulating our understanding of life and death'.